March is proving to be a spectacular month for new Indie music releases and veteran Indie band Spoon has only made the month more noteworthy. Hot Thoughts the follow up to 2014’s stellar album They Want My Soul drops on March 17th. The new release is an engaging web of rock, pop and Spoon’s own special proprietary sonic blend. Additionally there is an infusion of cleverly wry lyrics that make “Hot Thoughts” a very enticing creation. Once again the overall sound is a shift from the immediate past but also totally recognizable as something no one other than Spoon could proffer. 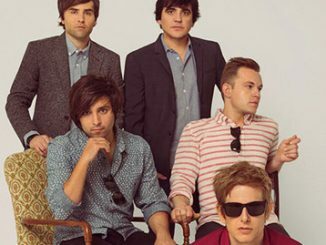 Hailing from Austin, Texas, Spoon has been on the music scene since 1993. At first glance they seem to fly under the radar of many popular music metrics. However each their nine albums have performed consistently well and display the band’s dedication to unwavering quality. Band frontman Britt Daniel describes the level of their renown as such, “It’s only indie level fame not showbiz level fame.” The band has seems satisfied with that level because it has allowed them to explore the less lauded corners of popular music, while keep their feet firmly planted on the ground. Their emphasis on being centered has allowed them to clock 20 plus years in the music business while maintaining their inner well being, not an easy accomplishment. On Hot Thoughts the line up consists of the two founders and pillars of the band, Britt Daniel lead vocalist, guitarist and keyboards and Jim Eno on drums, percussion and programming. Finishing out the lineup is Rob Pope on bass, guitars, keyboards and Alex Fischel on Keyboards and guitars. The album was produced by Dave Fridmann and displays a band that continues to be musically restless. On “Hot Thoughts” Spoon once again challenges themselves to produce a unique and alluring release. What jumps out upon listening to “Hot Thoughts” are the lingering influences of recently departed artists Prince and Bowie, both of which the band has always professed admiration. Prince is apparent in the more disco funk songs throughout the release. Bowie is meanwhile represented in the splendid amalgams of genres utilized on numerous songs. An example of this blending approach appears on the title track Hot Thoughts which is utterly mesmerizing with its cool polyrhythms, droning keyboards and chiming guitar. The song reminds me of a favorite Spoon track, Outlier off the band’s last release. The feeling is sensual and sexual and the exploding sonic on the bridge makes for an exceptional track. Whisper I’ll Listen to Hear it displays the mastery of the band. It begins with EDM goodness and an interstellar floaty vocal that is disembodied and then lays a throbbing insistent guitar over top. At the 1:50 mark the song turns over control to a Cure like throbbing bass and an infinitely expanding aural feel. The song is jam packed with sonic details which on paper make it seem over done, but is breathtaking to experience while you are left wondering how it was all pulled off. The clever Do I have to Talk You into It is trademark Spoon with that slightly claustrophobic sonic that is theirs alone. There is a nuanced balance of Britt Daniel’s vocal with the bass and keyboard that creates the magic. The paranoid isolated theme of the lyric also connects, “I feel cut off from everyone.” Here the ghost of Prince hovers with the gritty treatment that underneath has many studio techniques but seems organically effortless. First Caress has an alluring piano line that hooks you as each member of the band is completely clicked into the song while mutually supporting the others. I got a definite Arcade Fire vibe off this song about lovers and the passing of time. “Pink Up” is something truly extraordinary and my favorite song on the album. It is smooth and sophisticated with marimba tinged percussion. There is a long intro that builds the drama and then this soaring almost ethereal vocal that makes for a dreamy gauzy selection. It is a departure from the rest of the release but so winning that it just doesn’t matter. The track again displays the mastery the band has always had in spades. Can I Sit Next to You utilizes a funky disco beat married to a trademark off kilter Spoon sound. The song’s theme speaks to being down for the count but not quite being finished. The structure of the song along with those awesome bleating strings makes for song that will grow with each listen. Another outstanding moment on the release is I Ain’t the One. The song harkens back to the melancholy singer/songwriters of the 70’s. It begins as an electronic keyboard ballad which building and building to an impressive electronic fest at the bridge. The narrator in the lyrics simply and forthrightly is calling things as he sees them, the gist being I am not the one you are looking for, don’t build up your hopes because I can’t deliver. It is a “don’t miss” track. Tear it Down is a throbbing funk fest, providing plenty of bouncy, jaunty hooks. The theme points out the ironies and near misses we all experience. The “almost was” of many situations and how paths crossing but go unnoticed. It also speaks to the isolation our society is headed towards and how that isolation needs to be torn down. Sonically Spoon again earns esteem for weaving together counter intuitive sounds and making them unforgettable. “Hot Thoughts” is an impressive work and Shotgun is a convincing example of why the release is so good. Throbbing disco beats and driving guitars provide the background for the theme, which addresses how we have an individual responsibility about how we face trigger situations. It takes off on the adage about bringing a gun to a knife fight and expounds from there with lyrics like, “You are the one who brought the gun” and “I never wanted to take it outside…you are the one who made it no fun.” The fight represented in the lyric could be physical or philosophical but in either situation you have a choice to make about escalating the situation or being the bigger person by walking away. The final track Us is an excellent instrumental that begins with a forlorn horn section that provides a smoky avant garde jazz feeling. It is akin to walking into a Charles Mingus performance. 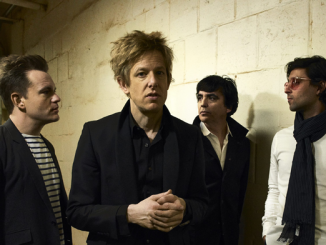 Of course the track is a complete departure from Spoon’s usual efforts but is arresting with its beauty. The song moves into a glichy electronica section before ebbing away, leaving behind a lasting impact. Hot Thoughts is an unconventional and totally engaging endeavour. 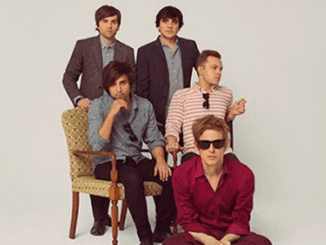 Spoon utilizes all the colors on their sonic palette. The anticipation for new Spoon material has a great payoff with an album which provides something for everyone in Spoon fandom no matter when they joined the cause. Tracks that really make the album standout over the usual indie offerings are brilliant selections like “Pink Up, Hot Thoughts, Tear it Down and Shotgun”. The band nicely balances their gritty rock selections with more experimental tracks like “Us” and comes out looking uniquely inspired. 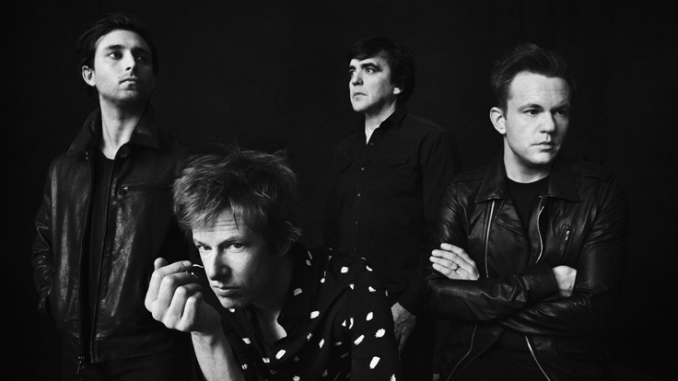 Spoon has a number of years under their belt but continually strive to provide fresh creations that build anticipation for their next release. Hot Thoughts only continues to burnish their well earned sterling reputation.